This damline was founded at Crabbet Park. 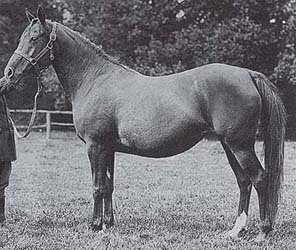 Rodania OA was one of the foundation horses bought by Lady Anne Blunt. This mare proved to be very valuable as her family is one of the most important in the world. Here I will focus only on her descendants in Poland. 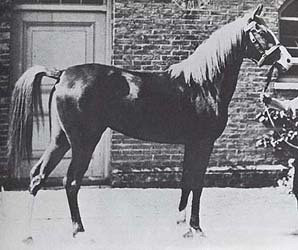 The first horse of this line in Poland was the famous stallion Rasim 1906 (Feysul x Risala), imported in 1924 by Baron Bicker of the Ujazd stud. 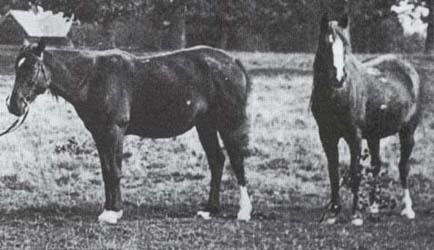 The first mare of this line in Poland was Ramayana 1924 (Nureddin II x Riyala), also imported by Baron Bicker to Ujazd in 1928. There are two branches of this family in Poland, one through Ramayana and another from the russian importation of 1936. They bought several horses at Crabbet, among them Naseem and the mare Rissalma. 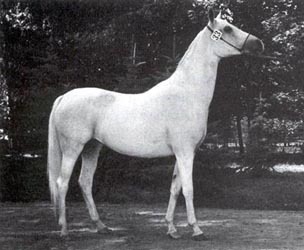 She was the granddam of Pienoczka 1952 (Pawodok x Naturalistka) imported to Poland in 1956. Ramayana was lost in 1939 but left a daughter, Maddy 1937 by Rasim III (she had three lines to Rodania OA). Maddy in turn gave birth to the daughter Madila 1942 by Lowelas. She was taken to Tersk during the war and it was not until her daughter Noma 1953 by Negatiw was imported in 1956 that this branch of the Rodania OA family came back to Poland. Noma produced only one daughter used in Poland, Newada 1960 by Grand. Another of Noma's daughters, *Narew 1964 by Branibor, was imported to US by Leon Rubin but died before leaving any produce. Newada on the other hand left five daughters all of which were used in Poland. 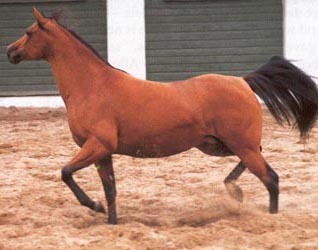 Her first daughter Nadzieja 1971 by Sabbat had a colt in Poland and was them exported to Lech Rybczynski in Sweden where she had the stallion Nadzin 1980. Nasturcja born in 1977 was exported to Italy in 1987 and left no daughter in Poland. 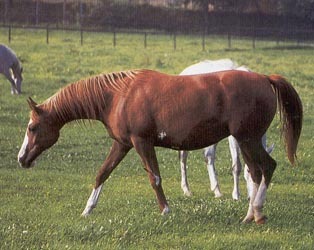 Neska, Newada's 1978 daughter, has left two daughters used in breeding, Nekroza 1991 and Nelba 1992. Nubia 1979 by *Algomej had three daughters before her exportation in 1987. Nubia's daughters Nurnia 1984 by Eternit was exported to Sweden and Nuta 1985 by Woroblin to Holland. 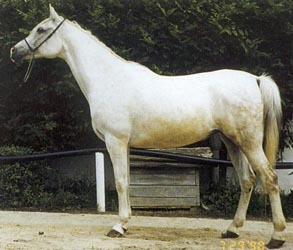 Nejtyczanka 1975 has left a valuable family at Kurozweki (later Tarus Arabians, privately owned). 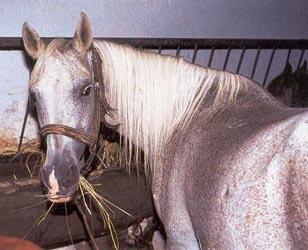 Her first daughter *Nizina 1981 by *Aloes was exported to Saihati Farms in 1985. Next daughter *Nimfa 1985 was used at Kurozweki and then exported in 1994. She left the daughter Niobe 1994 by *Pepton. In 1987 Nostalgia was born and she was first used at Kurozweki and moved to Bialka in 1999 when Kurozweki was sold to a private owner. 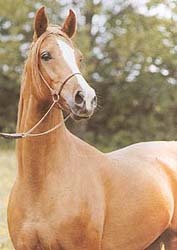 The next daughter, Nota 1993 by Brokat, was kept by Tarus Arabians. 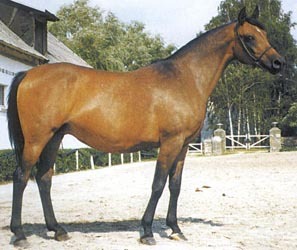 Nejtyczanka's last daughter to be used for breeding is Nagroda 1994 by Partner. 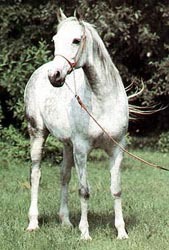 Just like Nota, she is owned by Tarus Arabians. 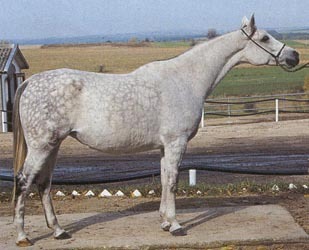 Beside her daughters Nejtyczanka also gave the stallion Nimb 1992 by *Eukaliptus. He has been used both at Kurozweki and by private breeders. The other branch of Rodania OA's family came to Poland in 1956 for the first time. 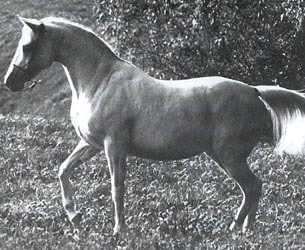 Michalow imported the mare Pienoczka 1952 by Pawodok. 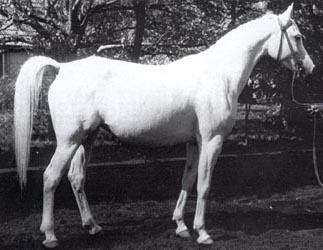 Her dam Naturalistka 1937 by Naseem was entirely of Crabbet breeding despite being born at Tersk. 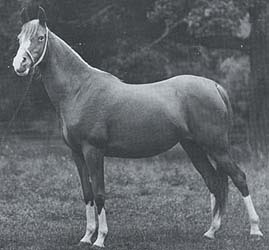 Her dam Rissalma 1932 traced back to Ridaa through Rissla 1917-Risala 1900. Beside Naturalistka, Rissalma produced Florencia 1936 by Faris and Priboj 1944 by Piolun. The only produce of Pienoczka was Planeta 1958 by *Naborr. She was a lovely mare with a good head. 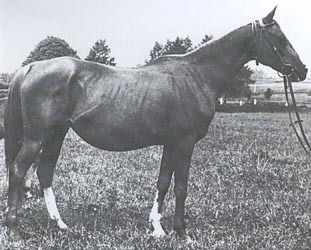 She had five foals before she died in 1971. Her first daughter and offspring *Paleta 1964 by Comet was exported to Ed Tweed in 1967. She was later sold to Daniel Gainey of Gainey Fountainhead Arabians where she had the sons Gai Warsaw 1969 and Gai Wodarczyk 1973. 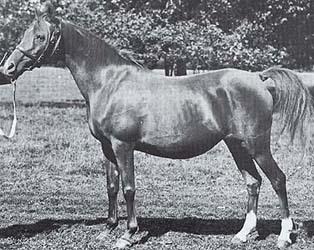 Her daughter Gai Gay Pride 1972 was the dam of performance champion Gai Argosy 1981. 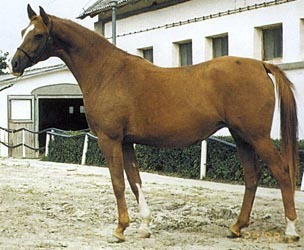 Planeta's next offspring was the stallion Pohaniec 1965, a full brother to Paleta. He was exported to Blommeröd in Sweden where he sired many valuable get, among them the triumvirate *Borexpo 1974, *Probat 1975 and Pusjkin 1980, all out of Borexia. 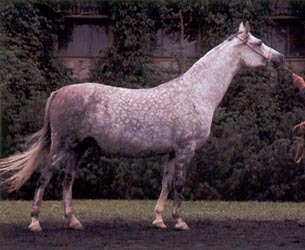 He was European Champion stallion (before among others *Salon). The second daughter of Planeta was to be the one to continue the family in Poland, Platyna 1966 by Czardasz. 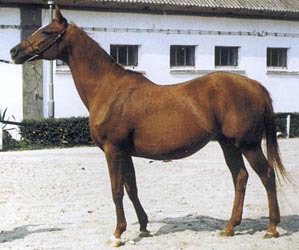 Planeta's last offspring were two full brothers by Gwarny , *Polonus 1968 and Pelan 1969 . Pelan was gelded and sold to Holland but *Polonus was used at Michalow before his exportation. None of his get left any offspring in Poland but his daughters Miniatura 1973 exp Germany, *Doryna exp US and *Misnia 1974 exp US have bred on. Platyna's first daughter *Plajta 1974 by *Gedymin was exported before leaving any produce. That was also the case with the next daughter *Persja 1975 who was carrying *Pandemonium 1981 when she was sold. 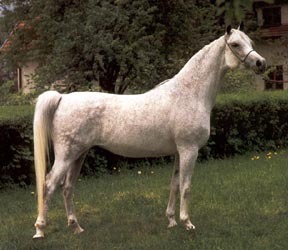 *Persja's granddaugher Parada 1986 (*Menes x Bint Pensja) was champion mare at Scottsdale. The next two daughters was both by Burkan, Pilawa 1976 and Pogon 1977. Both also came to Sweden but Pogon was later exported to Denmark. Pogon's daughter *Panda 1982 was exported in 1988 to US. 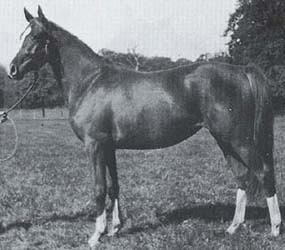 Patera, Platyna's 1978 daughter by *Bandos, was a great success as a broodmare. Two of her four daughters were used as broodmares and her son Polder by *Probat (double Planeta) is at stud in Sweden. Her most successful daughter is Palestra 1986, exp in 2001 to Sharjah. She is the dam of Prognoza 1990 by Etogram (three times Swedish National Champion mare) and of Palestyna 1994 and Palmira 1995, full sisters by Monogramm. 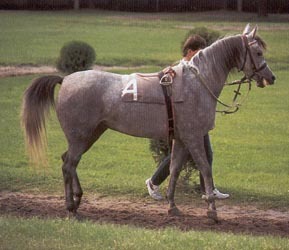 Palmira was the 2003 World Champion mare. 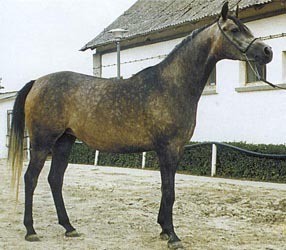 Pikieta 1982 by *Probat, the last daughter of Platyna, was sold to Halsdon Arabians in the UK in 1990. None of her polish-bred daughters has been used but her son HS Pirandelo 1999 by Pilot was leased by Janow Podlaski. Interesting to note is that Pirandelo carries three crosses to Planeta, one through his sire and twice through his dam.